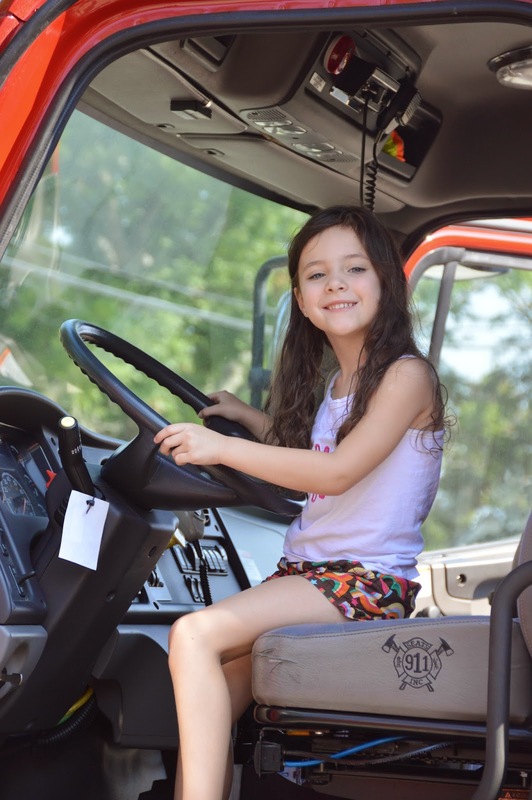 For a few years now it's been a summer tradition for a group of us to take the kids to a local forestation for a fire safety visit. It started out as a small group of us (literally one year there were only 3 mom's and our kids), but now it has grown to be a huge group. I've kept it no secret from everyone that this is not exactly my favorite summer tradition. 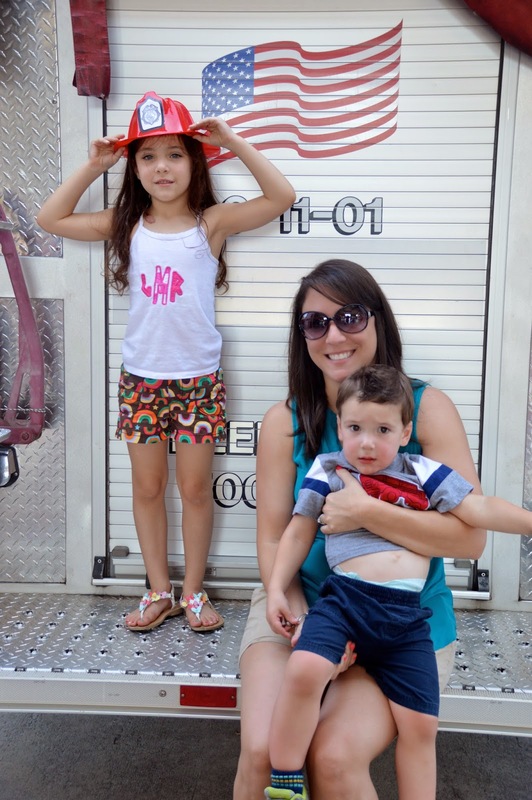 It's hot and LL is only interested in the fire truck portion. 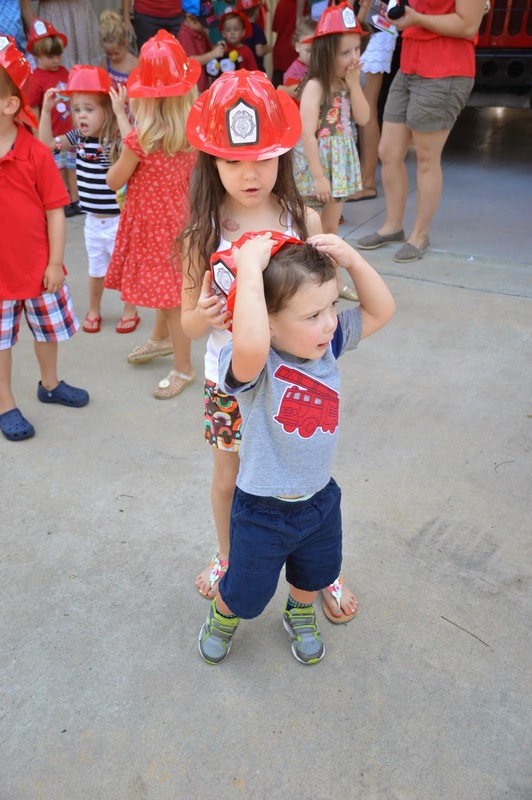 We still go because, even though I don't love it, I think it's important for her to learn about fire safety and to see the fireman get dressed up. To be honest though, this year I was pretty excited. I didn't take Cooper last year because he still had two naps a day and our trip fell during one of his naps. This year, he was totally going with us. And I knew that home boy was going to loose. his. mind. He loves all things vehicle (hello - we had a construction birthday party), so I knew this was going to blow him away. And I was right! It really was more fun seeing it all through his eyes and how excited he was. And because LL is all about some sibling rivalry, she had a blast because she was trying to have more fun than Cooper. ;) So it was an all around great visit for all of us! He's got that pointer finger ready! 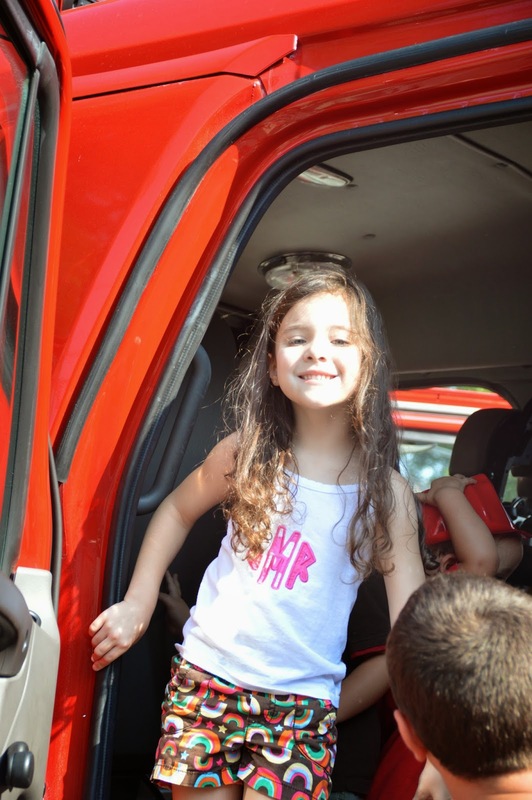 We had to wear our firetruck shirt, of course! 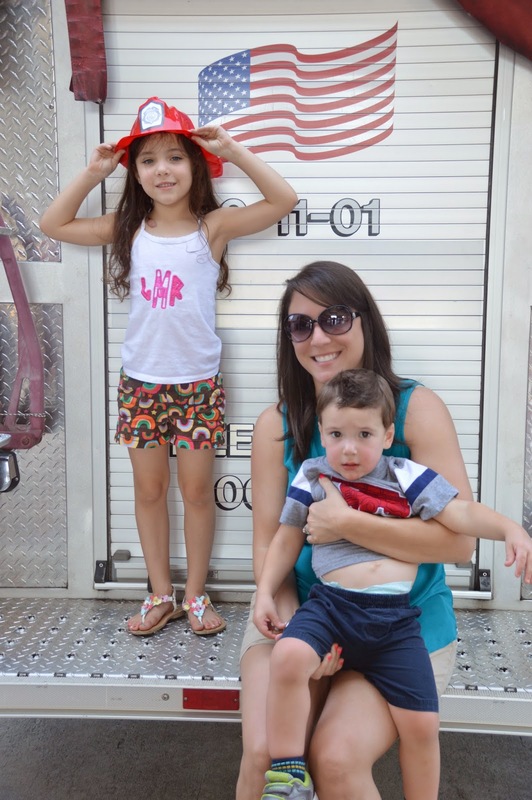 While everyone else toured the fire house, Cooper and I stayed outside for him to see the trucks. 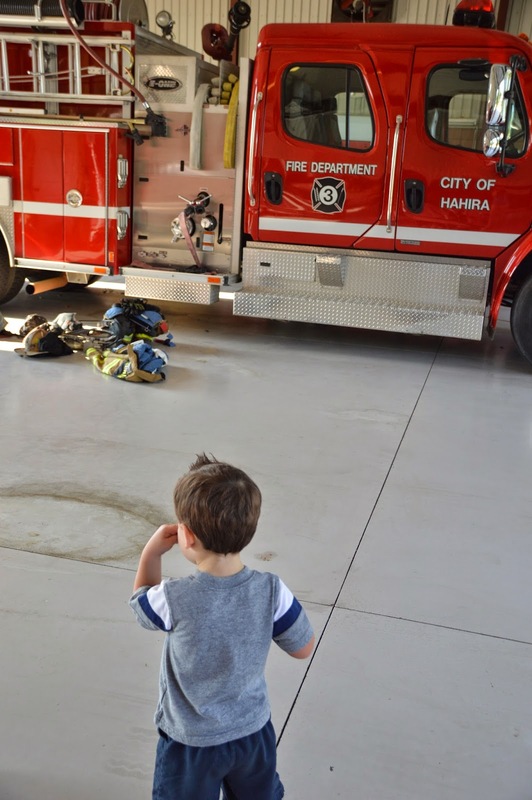 I had already taken him in the firehouse (to change a poopy diaper - great timing, kid) and knew it wouldn't be anything that he would be interested in. 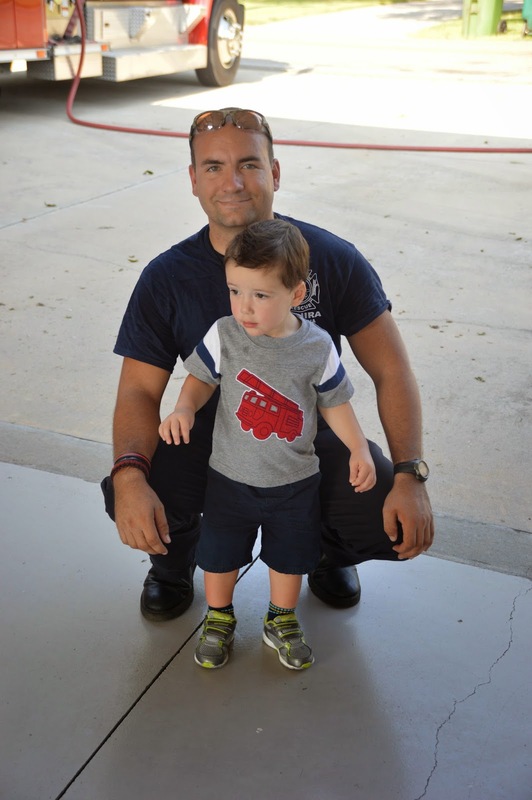 While everyone else was inside, Cooper got a picture with one of the firemen! LL had so many friends come this year - she loved it! This was Ansley's first year coming with us. Waiting to squirt the fire hose. Cooper had no hesitation about it (and I actually think he cut in line to get up there faster - haha). And for the first year every, LL did the hose, too! Can't be upstaged by little brother, right? The one thing Cooper didn't want to do? 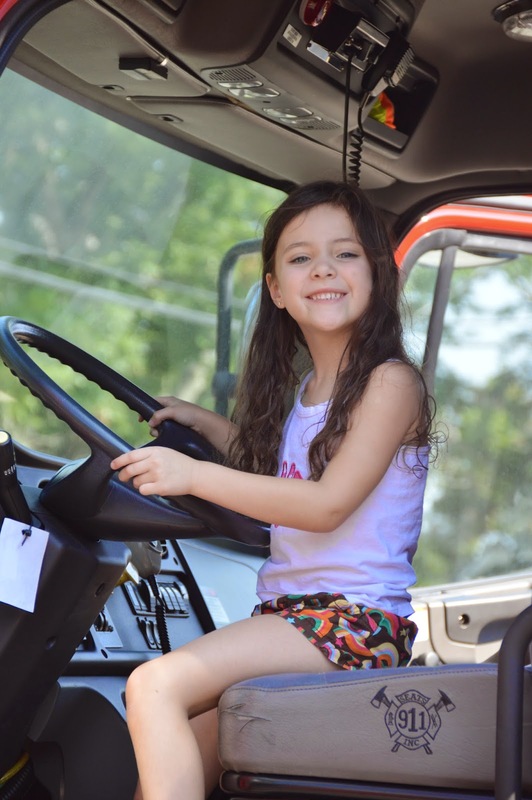 Get in the firetruck! I was so surprised! So he stood on the wall the whole time that the other kids went through the truck - haha. Somebody turned on the lights to another truck during this. Cooper was so excited. After the forestation we went to Chick-Fil-A. The kids played for a while and then we ate lunch. It was so cute because, for the first time ever, we just put the kids all at their own table. And they did so great! Of course it was adorable. Cooper - 24 Months Old!